Do the words “pot roast” intimidate you? Don’t be afraid! Embrace the challenge and we promise, once you try this recipe you will feel like a super hero in the kitchen (and your family will be super impressed too). Pot roast can be an amazing addition to your weekend dinner repertoire when made according to a few fundamental roast rules. The Meat – The meat you use is important. A classic pot roast is made from chuck roast, but it can be expensive if you can’t find it on sale. You can skip the chuck roast and use a pork shoulder, which when following rule #2, can be melt in your mouth delicious. Cooking Time – You must understand that tougher pieces of meat have lots of tough connective tissue that will only soften when cooked at a lower temperature for a long period of time. It’s simple, you can’t rush a perfect pot roast. The Sear – This browning process is what’s going to give the roast flavor and texture. By searing the meat, you are locking in all of the natural juices, which will help break down the connective tissues and fat. Preheat the oven to 275 degrees F. Generously salt and pepper the pork shoulder. Heat the 2-3 tbsp of olive oil in large pot or Dutch oven over medium high heat. Add the halved onions, carrots and celery to the pot, browning them on all sides. Transfer the veggies to a plate. If needed, add a bit more olive oil to the pot. Place the meat in the pot and sear it for about a minute on all sides until it is brown all over. Transfer the roast to a plate. With the burner still on medium high, use about 1 cup of beef broth to deglaze the pot, scraping the bottom with a wooden spoon. Place the roast back into the pot and add enough beef stock to cover the meat halfway. Add in the onions and the carrots, along with the fresh herbs. Put the lid on, then roast for 3 to 4 hours (3 hours for 3 lbs and 4 hours for 4-5 lbs). The roast is ready when it’s fall-apart tender. Remove meat (carefully) to a cutting board and shred with a fork. 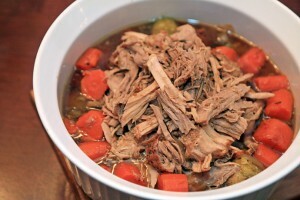 Place the shredded meat back into the pot with the cooking liquid and veggies. Spoon and serve. Copyright 2014 Cooking Shorts. All rights reserved.